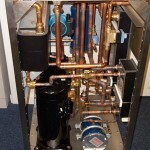 A domestic heating system using a thermal transfer heat pump. 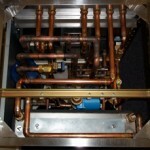 This heating technology can achieve extraordinary levels of efficiency. The “coefficient of performance”, which is ratio of output power to input power, can exceed 400% for a thermal transfer heat pump in normal operation. This system has a number of novel features including a high output temperature of 65℃ and multiple refrigerant compressors. It is possible to run the system with multiple input sources, allowing combinations of borehole, solar thermal and air exchange to be utilised.